When the flag goes up...it is time to run! They will stay warm...learn more here! 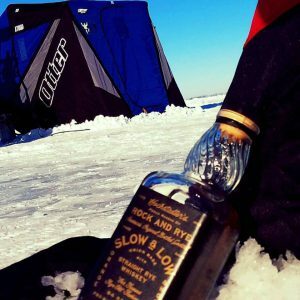 Get your ice fishing checklist here! Want perch? Want Walleye? Learn how to catch them here. Learn about ice fishing equipment. Back in the real world, as soon as that temperature dips below that magic mark, of water freezing, you either look for your ice skates or look to take out those short rods. No matter how many cobwebs are on those rods, they need to be pulled out, because in a few weeks, if the temperature stays below that freezing mark, that water on your favorite lake will freeze over. Some calm night…that water hits a point where the laws of thermodynamics take over and all of the sudden..no more waves. No more foam on the shore. No more pelicans, unless they are dead, of course. The ice may be only 1/2″ thick by morning. No matter. If the temperature stays low enough, you will soon be able to venture out and drill a hole over your favorite spot on that lake. So, you’ve popped your first hole in the first ice of the year…and now what? Well…that’s why you are here, right? Ice Fishing Rods – How to purchase the right one for you. 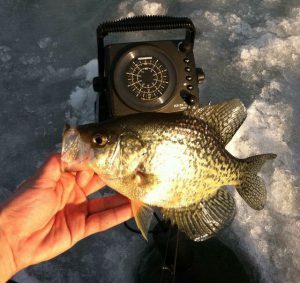 Check out our Ice Fishing Blog for latest updates! Many of the northern states have ice fishing reports you can peruse at your leisure. Some are true. Most are just ‘bragging’. Find a buddy who knows the lake well. He’s the guy with frostbite on his nose. You’ll know him. He smells like sipping whiskey. (You better find out what kind he likes and buy him some!) After you’ve shown this fellow you can appreciate his taste for fine sipping whiskey, he’ll likely tell you what is “going on”. Now I want you to be on guard at this point. He WON’T tell you everything, because, of course, you’ll end up sitting on HIS finest ice fishing spot. So, he’ll generalize, he’ll be vague, just tip-toe around the specifics. You know that guy, don’t you? But THAT is the guy you want to get to know if you want to bring home some fish. Or, you could hire an excellent ice fishing guide. It might be cheaper. May I suggest Mark Bry at Bry’s guiding Service? So, it’s later in the winter, and you want to go out but you don’t know what to do? That’s OK. Just start going through our website and look over the ice fishing articles. We have tips from professionals who make their living out ice fishing. We also started an ice fishing shopping list with tips for each item on our ice fishing checklist. Some people have all the time in the world. Others go ice fishing.